This is the proper method of a Brahmin Brahmachari or householder to introduce himself to elders , Our Gurus and people like saints who are fit to be revered. Viswamithra , Jamadagns , BHaradwaja , Gowthama , Athri , Vasishta , Kasyapa and Agasthya. Each of these Gothras were further split in to various branches and an exhaustive list contains the name of gothras given in a book with me lists about 436 Gothras . out of these , in a survey done by me I found that the seven Gothras Bharadwaja Gothra (19.5%) , Haritha Gothra ( 6.7%) , Kashyapa Gothra (5.64%) Kaundinya Gothra ( 10,8%) , Kaushika Gothra( 13,60%) , Srivathsa Gothra (11.12%) and Vadhoola Gothra (4.56%) , account for 72% of the Tamil Brahmins.. Please note same Gothra people may follow different Vedas and Suthras and have different Pravaras. Rishis . The Gothras can have one Pravara Rishi, Two pravara Rishis , Three Pravara Rishis , Five Pravara Rishis and Seven Pravara Rishis. A classification of the total list of 441 Gothras showed 19 Gothras with one pravara rishi, 15 Gothras of two pravara rishis, 348 Gothras of three Pravara Rishis and 54 Gothras of five Pravara Rishis. Please note that there are many Gothras with groups following different Pravara Rishis. This is possibly the Veda which was studied by our patrilineal ancestors . Though 4 vedas are listed , , in South India people who follow Atharva Veda are not to be found. But there are two branches of Yajur veda called Shukla Yajurveda and Krishna Yajurveda. In South India also several scholars have mastered more than one Veda but they always term themselves as belonging to one Veda only. Suthra means “thread” but by Suthra what we mean is the Guidelines for doing our rituals. Apasthambha,Bhodayana ( not that common- Bharadwaja , sathyashada , Vaikanasa , Agnivysya )are Sutras for Yajur Veda. Al our rituals have to be peformed by Following the Sutra of our clan,. If due to non availability of scholar priest trained in our Suthra , if we perform using rules of other Suthra , then we are supposed to repeat using our Suthra later. 5, In some families Abhivadaye is told and Namaskarams is done later, In some other families , first Namaskarams is done and then Abhivadaye is chanted. We have to follow our family traditions. 6,If we have to touch the feet of the elders after telling Abhivadaye, we have to keep our hands as a cross and touch their right feet with our right hand and their left feet with left hand. If we are not able to touch, we have to touch the ground before them. 1.Abhivadaye BHargava , chyavana, AApnaavana, Ourva, Jamadagnya Pancha rishaya pravaranvitha , Sri Vathsa Gothra, Aapa Sthamba Suthra, Yaju Shakha Adhyayi Sri Ganapthi Satmaanamaham Asmibho. 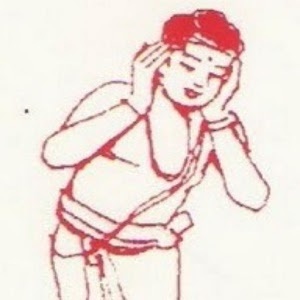 2.Abhivaadahye AAngeerasa, Baarhaspathya, Bhaaradwaaja trayaarsheya pravaranvitha, BHaradwaja Gothra, Aapasthambha suthra, Yajushaka Adhyayai Sri Subrahmanya Sharmaanaham ASmibho. 3.Abhivadaye Vasishta , Maithravaruna , Kaundinya thraya risheya , AApasthambha Suthra , Yaju Shakha Adhyayi , Sri Ramachandra Sharmaanaam Asmibho. Its great piece of information. Though we do the Abivadya, during our sandhyavandanam, never knew what we say and why we do. But I would like to point out that, one Gothra, "Bhargava" is missing in your list of Gothras. Thanks. Simple and easy to understand article. Sir, Please keep up your good work and keep writing such articles. All this precious knowledge, which has survived for thousands of years must not be lost. Pranams to you. Namaskaram! Thank you for the wonderful post. Could you please share with me the pravaram (saptha rishi) for Shandilisyaa gothram in samskritam? Thank you very much for the wonderful message. I'm wondering if one can recite to their father. Can you please clarify? My husband recites to his father everytime he does a namaskaram. I've not seen it anywhere. One should not perform namaskaram along with Abhivadaye to their own parents, as the purpose of Abhivadaye is to introduce ourselves and tell the lineage to other person. In this case there is no point of introducing ourselves to the parents. This is what I learnt and want to share with you.